With your help we are improving DriveSpan App continuously. So, check out what you get with the latest update. 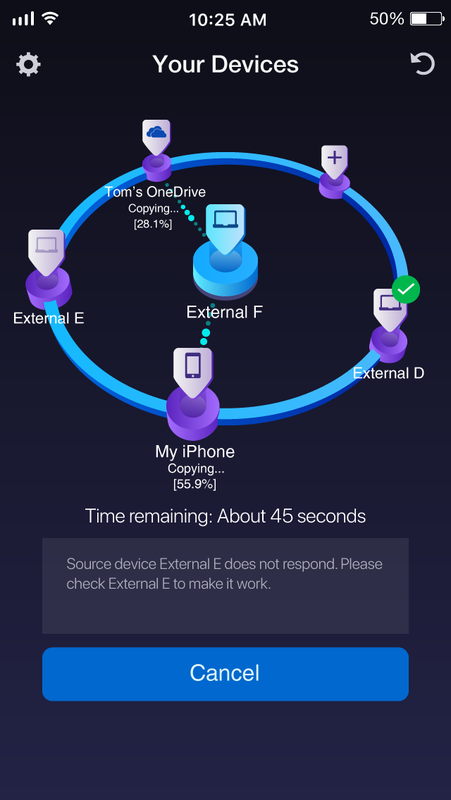 Can I backUp and consolidate several smartphones in one go with DriveSpan App and Wifi+Transfer? Yes indeed, with the latest version of WiFi+Transfer you can simply connect your mobile device running WiFi+Transfer App with your other mobile device running DriveSpan App. Then add one or more smartphones and tablets into your wireless consolidation with DriveSpan App and finally access all your content on one central storage location free of duplicates. Simply free your smartphones from unnecessary ballast. Check out this video to see how it works. Use WiFi+Transfer App and add one or more mobile devices for wireless consolidation with DriveSpan App! Overflow of data and media on your mobile devices? Want to consolidate data from different smartphones and tablets free of duplicates? With free WiFi+Transfer app you have no restrictions and can install it on numerous devices. Simply connect your mobile device running WiFi+Transfer App with your other mobile device running DriveSpan App and integrate one or more smartphones and tablets into your wireless consolidation with DriveSpan App. Then access all your content on one central storage location free of duplicates. Super easy transfer and media consolidation from one or more mobile devices! Is there a Demo Video available to show how DriveSpan App works? I get an Error Message in ‘DriveSpan App’, what can I do? Via DriveSpan App for iOS and Android you can easily merge and consolidate all of your media and data located on a PC and attached external hard discs / storage drives, mobile devices, or on your cloud storage to one central storage location (e.g. a PC, an external hard disc or the cloud). All included devices for consolidation – your sources and the target – are controlled wireless via ‘DriveSpan App’ within the same WiFi network. Before starting the consolidation, you should check your configuration and your use case for enabling a smooth and error-less consolidation. For details on setting up your devices for consolidation, also check Nero KnowHow 00144. For a demo video of DriveSpan App check Nero KnowHow 00154. During the consolidation, DriveSpan App will identify issues and if possible will provide clear text solutions via the info box on the home screen. In most cases this will help you to resolve the issue. For example: the above message shows that external drive E is not responding. In this case you should check the proper physical connection and also the power supply of your drive (if the latter applies for your case). After the consolidation is finished, respective errors will be documented in ‘Overview’ > ‘Error Report’. The ‘Error Report’ lists all given issues during a consolidation with related error codes, and a description of the issue. If you did not manage to fix your issue based on the proposed solution in the info box, please check the ‘Error Report’ and report your issue including the given error code. If no errors occurred during your consolidation, the ‘Overview’ will not show an ‘Error Report’.